Kevin Conlon of Rehoboth Beach really knows how to enjoy life. He is a well-respected Boy Scout leader, active in his church, and an umpire for the Rehoboth Little League. Conlon also loves golf. Every year he meets his three brothers – Tim, Mike, and Dennis – for a four-day session of “spring training.” The brothers also invite several friends to join them in for the annual odyssey. For some reason, probably because they always have a good time together, the group keeps coming back. 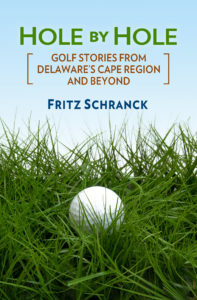 The honorary Conlon brothers include Mark Winter, George “Buzz” Matthai, Wofford Humphries, Pierce Abell, Bill Maxwell, and some Cape Gazette golf columnist Kevin knows. The Conlons and their friends reunited again April 24 at Myrtle Beach, the golfing Mecca of the Southeast. The Grand Strand stretches for several dozen miles along the Carolina coast. If placed over a map of the Cape Region, the Myrtle Beach area would stretch from Dover to the Ocean City Inlet. One hundred golf courses now entice golfers from all over. Most take advantage of package deals offered by the golf courses and the local hotel industry. The Conlon group stayed in two townhouses at Litchfield Beach & Golf Resort, a major development near the southern end of the Strand. The condos at Litchfield are well maintained, varied in design, and conveniently located near several courses. Townhouse owners make their places available, and Litchfield’s staff handles both tee time reservations and all rental management. This year the Conlon group played Willbrook Plantation, Wild Wing’s Avocet Course, Heritage Club, and The River Club. Willbrook Plantation is a former private course. Water came into play on at least 16 of the scenic holes; at least, it seemed that way. Wild Wing’s Avocet course was fun for the whole group, especially the high-handicappers using the white tees. Heritage ranked No. 21 in South Carolina on Golf Digest’s 1999 course rankings, and deserved it. An alligator about 8-10 feet long was among the hazards just off their 12th fairway. The River Club was a good blend of water and trees, and would seem familiar to players at Sussex Pines Country Club. Dining options along the Strand have improved significantly. Seafood used to be available any way one desired, as long as it was batter-dipped and deep-fried. Other options are now welcome. The she-crab soup at The Mayor’s House in Litchfield Island earned rave reviews along with the steaks, oysters, and ribs. The Calypso Bar & Grill in Litchfield was similar to Obie’s on the Rehoboth Boardwalk in atmosphere, food, price, and location just next to the ocean. For the Conlons and their honorary brothers, the four days of fun pass by too quickly. Can’t wait for next year. Where are we playing? Joseph Gaffney of Riverdale, Maryland, the father of Pat Mylander of Lewes, had a hole-in-one on the 15th hole at Old Landing Golf Course April 21. Ed Cahill, a regular at Old Landing, witnessed Gaffney’s 106-yard 9-iron. All Cape Region golf clubs are invited to call in these delightful events to The Golf Column and help spread the word. Cape Henlopen High School’s golf team gained a split in a tri-meet April 22 against Seaford and Polytech at Jonathon’s Landing. The Vikings beat Polytech 162-172, but lost to Seaford 159-162. Josh Marr and Mark Johnson shot 39s, Dan Prettyman had a 40, and Adam Talley and Bob Croce shot 44s. The team avenged their loss to Seaford by beating the Jays 176-187 at Rehoboth Beach April 27. Prettyman and Josh Marr tied for medallist honors with 43s. Bob Croce shot 44 and Mark Johnson completed the team scoring with his 46.